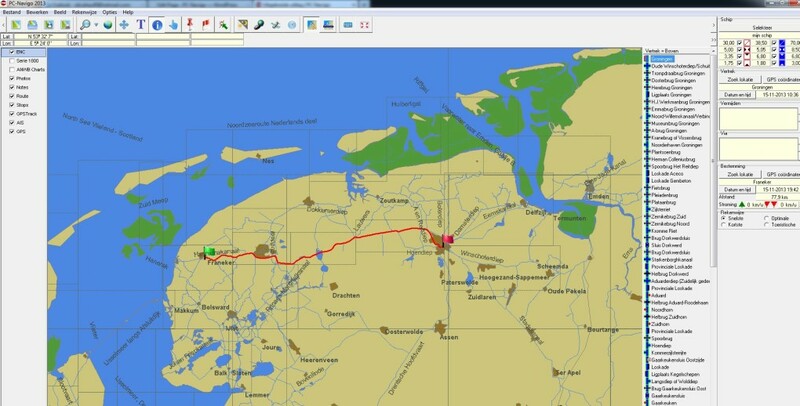 PC-Navigo is a full blown voyage planner and navigation system for the inland waterways; it literally shows you the way in these waters. Depending on which version is used (Europe, Benelux, Netherlands, Germany, France) voyages can be planned and during navigation the GPS provides position information and velocity. 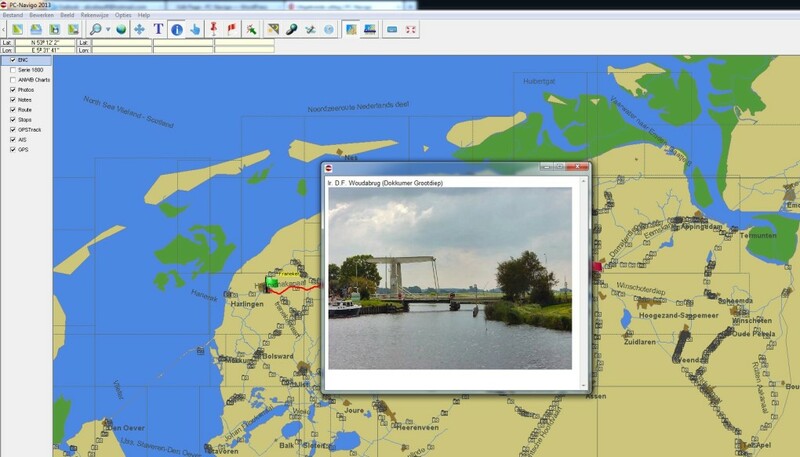 The software contains all operating hours, dimensions, communication data, VHF channels and other information about all bridges and locks in the waterways network. The program checks for stoppages or limitations that may block your passage. Many bridges and locks have pictures, that can be shown to provide information about the local situation. The voyage planning process shows all details of navigation hours, the progress one can make, and the total time of the planned voyage. The included charts are vector charts in ENC format, meaning that they can be manipulated (rotated, dimmed and/or enlarged) without loss of resolution. These ENC have been made available by the local waterway authorities; they have been enriched and completed with data collected by PC-Navigo. 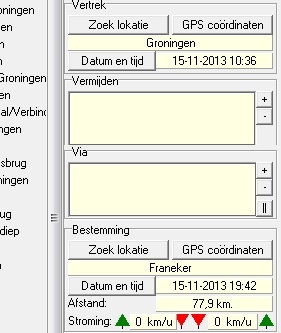 The result allows full navigation on the basis of the digital data in PC-Navigo. The data have been collected and maintained with the largest possible care; they are checked regularly and compared to all available sources, such as the local navigation services and waterway authorities. Nevertheless mistakes cannot be totally excluded: the skippers will always remain responsible for a safe navigation. 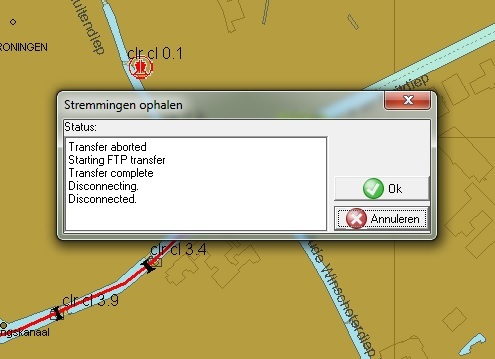 By means of a connected GPS receiver (GPS mouse) your position can be shown in the middle of your screen, and the chart will shift in function of your changing position. This is useful to navigate on larger waterways, where you “see your boat sail over the chart”. Make sure you always follow a buoyed channel: differences between a chart and reality can occur due to modifications that have not yet been implemented in the charts. A separate GPS monitor shows your position, speed and course. Before planning a first voyage you must enter the dimensions and some other data of your boat. Under the EDIT menu in the main menu you can choose SHIP’S DATA. You provide the type of boat, then its dimensions (length, beam, air draught and draught, cruising speed). You may also indicate preferences (open sea navigation, daily navigation hours, etc.). These data are the basis for the voyage planning. With a separate screen section on the right you can plan voyages. You only have to provide your point of departure, your destination and the date/time of departure. PC-Navigo will provide the voyage immediately, that is, if the voyage is possible with the dimensions of your boat. You have a choice between a fastest, optimal, shortest or touristic route. In case of stoppages or obstructions an alternative route can be calculated. You may enter intermediate ( “Via”) points or points to “avoid”. You can modify a voyage this way, or bypass waterways that you do not want to navigate. 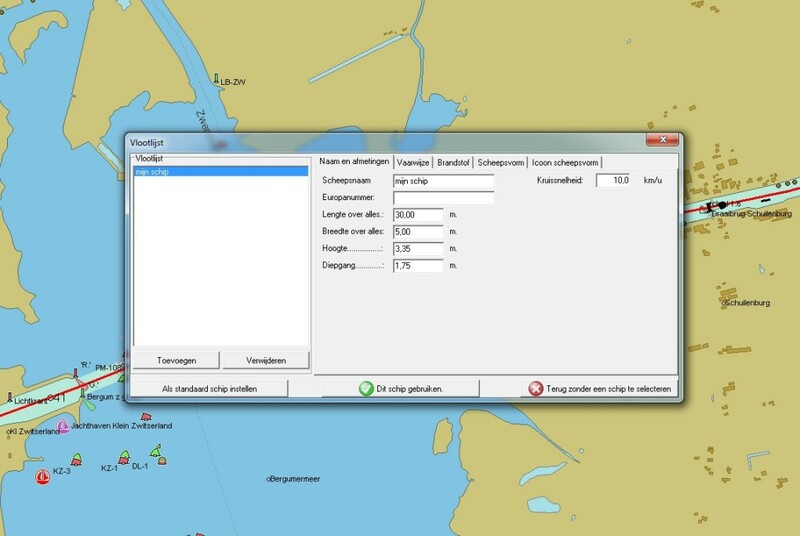 After having planned a voyage, PC-Navigo can be set in the navigation mode. If a GPS receiver is connected, your boat is shown in the centre position of the chart. The details of the voyage appear in a separate side screen: VHF channels, bridges, locks etc. Details of each bridge or lock are shown before you arrive at its position, so that you have the dimensions, operating hours, and phone numbers in advance. The list of details shifts with your GPS-position, just like the chart. Certain waterway data such as speed limits, authorised dimensions and block VHF channels are also shown. If your progress differs from the original planning, PC-Navigo can adjust the remainder of your voyage and your ETA. PC-Navigo can be connected to an AIS-transponder, a device that many vessels have to broadcast their position. With the AIS signal other ships can be shown in the navigation charts. It provides information about name, course and velocity of the other ship(s). A planned voyage can easily be saved for later use or transferred to another computer on which PC-Navigo has been installed. Thus you can plan your voyages at home, and take the result to the computer on board to navigate. All aspects of the planned voyage are maintained, including the original departure date, navigation hours and so on. To modify these, you can simply enter a new date or time or departure position. PC Navigo can be installed on multiple computers, without any limits. The installation CD does not have any copy protection. Instead, the program is protected with a so called license dongle (USB-key). This dongle lets you use your license on any computer that contains PC-Navigo. The dongle has to be connected while you start the software. Take good care of this license dongle, it contains the full value of the software! It cannot be replaced if it is lost or stolen, but if it’s damaged or broken, it will be replaced by a new one after you have sent the original dongle back and paid for the replacement key. Attention ! New keys can only be made for last version of the software. PC-Navigo takes planned stoppages and obstructions into account, if these are listed on a special list maintained on a daily basis and downloadable from the Internet. If you have an Internet connection on board, you may download this list daily, so that you always have the most up to date information on stoppages. For the use of other functions of PC-Navigo, you do NOT need an Internet connection.